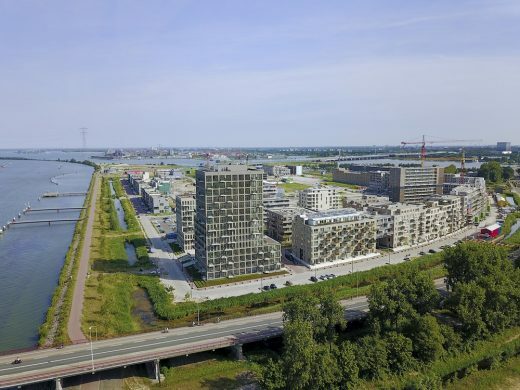 On the northern tip of the rapidly developing Zeeburger Island in Amsterdam Studioninedots, commissioned by de Alliantie and Lingotto, designed two striking volumes. 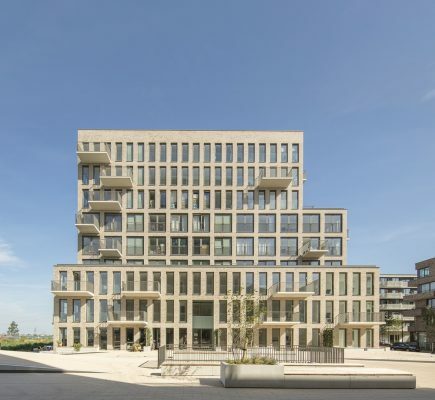 Due to their stepped profiles and changing facade rhythms they appear different depending on the viewing angle. All 142 residences plus the shared outdoor spaces on the deck are orientated towards the magnificent views. Studioninedots recognises a growing need for better collective and public spaces for cities, which are densifying at an increasing rate. 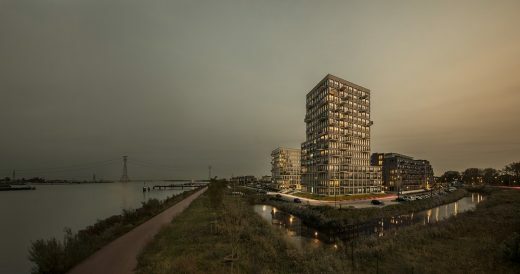 On the site where the rapidly developing Zeeburger Island meets the calm of the water and the low, clouded skies, the practice conceived a spatial intervention that functions as a catalyst for meeting and connection between residents. 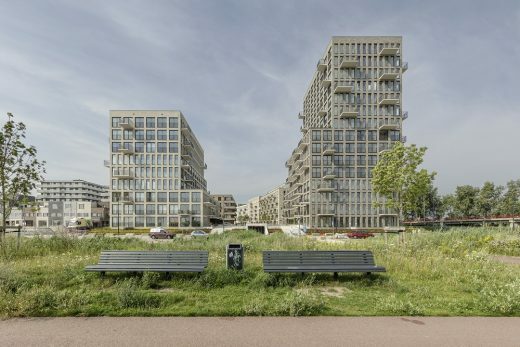 Instead of a massive block, the design houses the required functions in two slender, high buildings resting atop a shared, semi-underground car park. 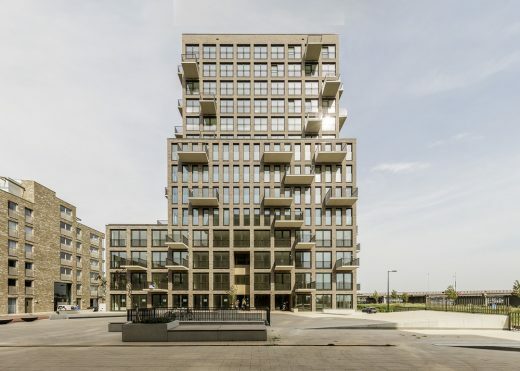 This creates a roof deck between the buildings for shared use, and the building’s open profile frames wide views of the Buiten-IJ for the neighbourhood to enjoy. Both complexes become narrower towards the top. 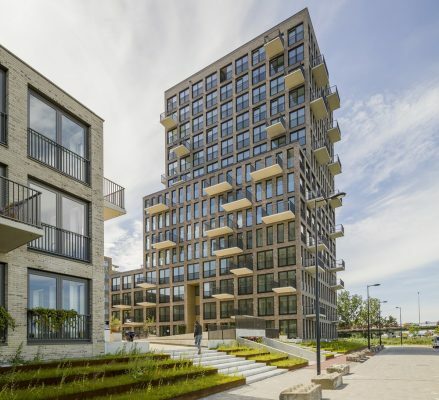 The volumes step up and recede every few storeys in response to surrounding buildings. 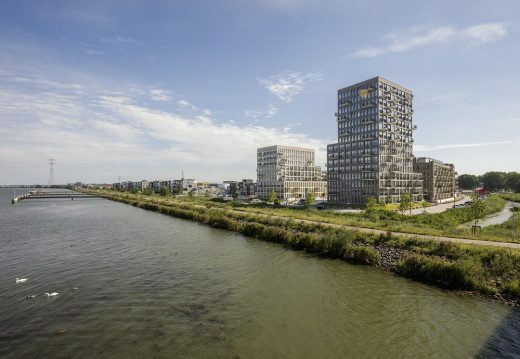 This reduces the amount of apartments per floor, which creates setbacks that are used for private outdoor spaces and green roofs. 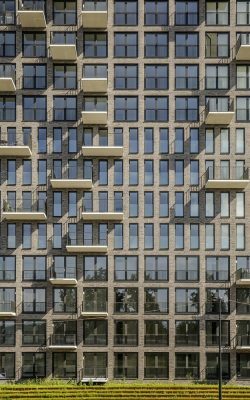 Fronting all sides, the buildings feature two alternating facade rhythms – with either compact or wider windows – which step accordingly. 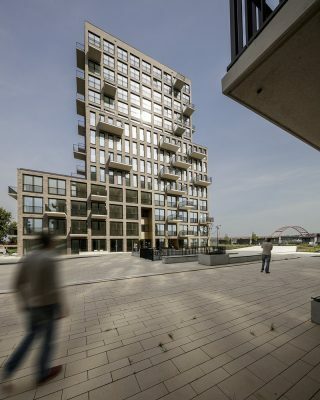 The buildings have a compact structure organised around a core that contains all the apartments’ functional spaces. The living rooms and bedrooms are then positioned on the perimeter to maximise views. 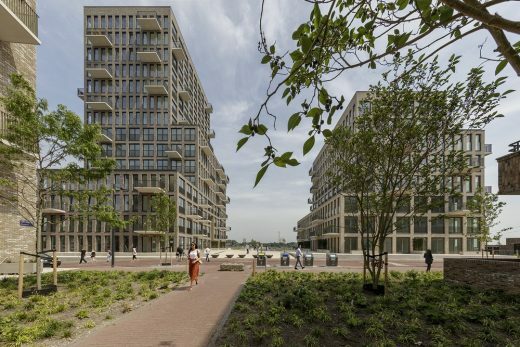 This quality of space is accessible for every resident regardless of whether the apartment is allocated for private or social housing. 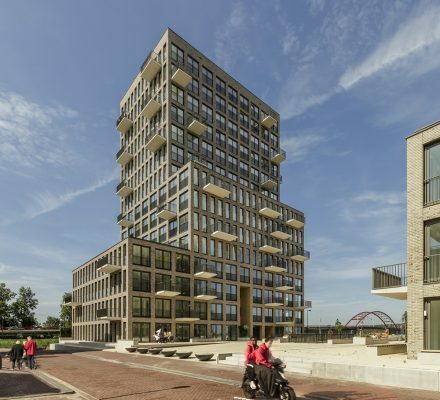 The lower building (‘De Generaal’) contains affordable rental apartments; residents in the higher tower (‘Akropolis’) are aged 55+ and members of a residential community. Throughout the buildings, shared facilities are provided for both the association and neighbourhood.